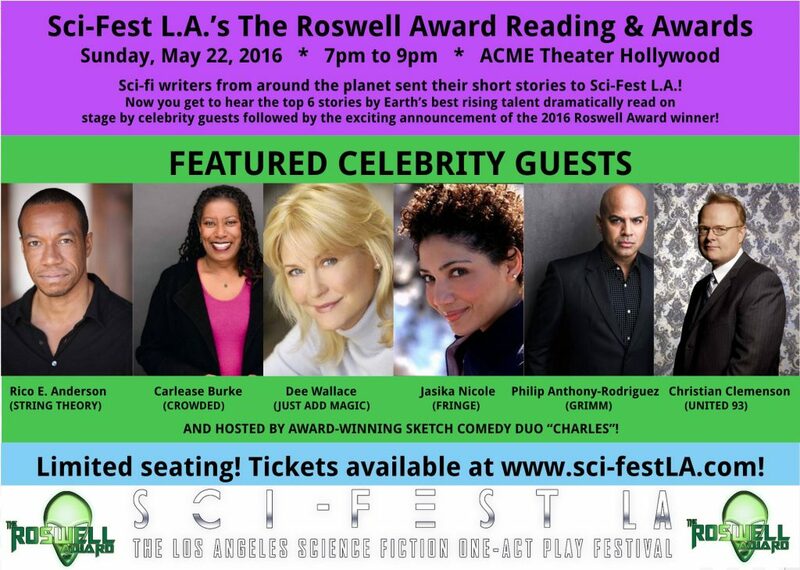 The finalists for the Roswell Award short story writing contest for adults will have their stories read aloud at Sci-Fest during an awards ceremony on Sunday, May 22, 2016. “Constant Change” by Diana M.
The judges for the award are Nicholas Meyer (screenwriter for The Seven-Per-Cent Solution, and director of three Star Trek movies), Jordan Roberts (writer and director of Around the Bend), Mike Werb (writer of The Mask, Face/Off and Lara Croft, Tomb Raider), Loretta Hidalgo Whitesides (co-creator of Yuri’s Night, The World Space Party), and Maryelizabeth Yturralde (co-founder of Mysterious Galaxy bookstore). The author of the winning entry will receive a cash prize of $1,000.00. Complete details here. This entry was posted in Awards and tagged Roswell Award, Sci-Fest by Mike Glyer. Bookmark the permalink.